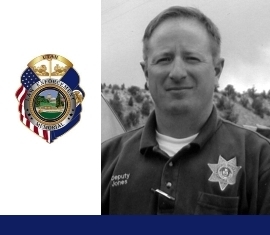 Deputy Jones lost his life while attempting to arrest an intoxicated motorist. The victim had stopped a truck in Alvey Wash, an isolated location six miles south of Escalante. After arresting the driver, Deputy Jones was confronted by the passenger armed with a high-powered rifle. In the exchange of shots, Deputy Jones was killed and the passenger wounded. The two suspects then fled the scene. They were apprehended several hours later at a police roadblock near the Arizona border. Both were convicted and sentenced to prison. The driver died of natural causes in 2008 while still in prison. The killer remains incarcerated. Deputy Jones left a wife and five children. He is buried in Orem City Cemetery. His bronze memorial plaque is sponsored by the Garfield County Sheriff’s Office. To the family of Officer David Jones. I had the honor of knowing David, and attending the academy with David. David was kind, and thoughtfull of others in time and need. David helped inspire me to be a good officer. He taught me discipline, honor, ethics, and teamwork. He will always be missed, remembered, and I look forward to seeing him once again when I go home. May God bless you and yours in all that you do! Thanks for all the memories little Brother and for being there when no one else was. I think of you daily. All the comments are a help and remind me of just how good you were. Love and miss you uncle David.